Here is another card I wanted to share with you. Again I was browsing Pinterest and got a little inspiration for this card. 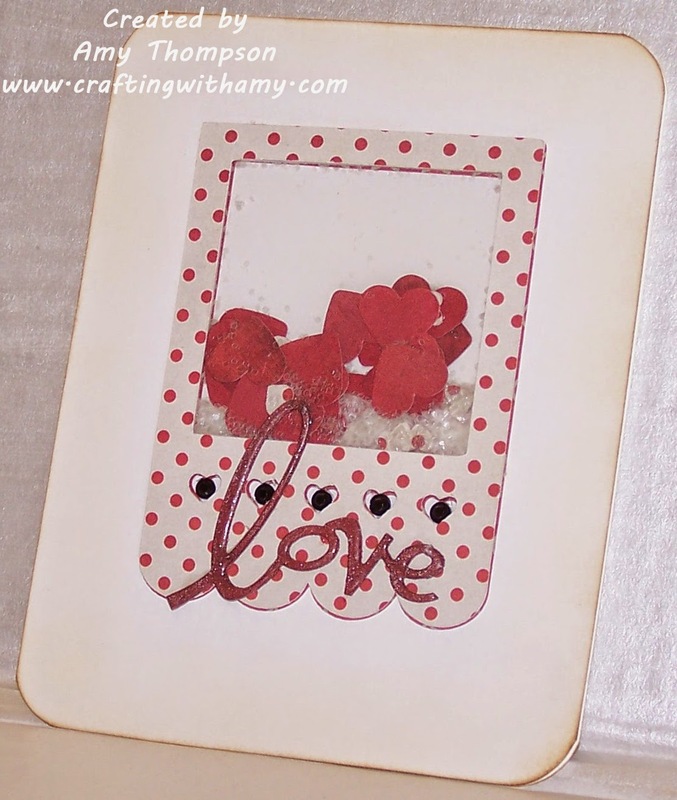 I wanted to make a shaker card and add some cute little hearts I punched using a pinch from Recollections. I added some glitter and cute the frame and the sentiment from CTMH Artbooking Cricut Cartridge. I hope you like my card and it has inspired you. Please check out this weeks challenge going on over at Fantabulous Cricut Challenge blog. I wanted to start some Christmas cards early this year. 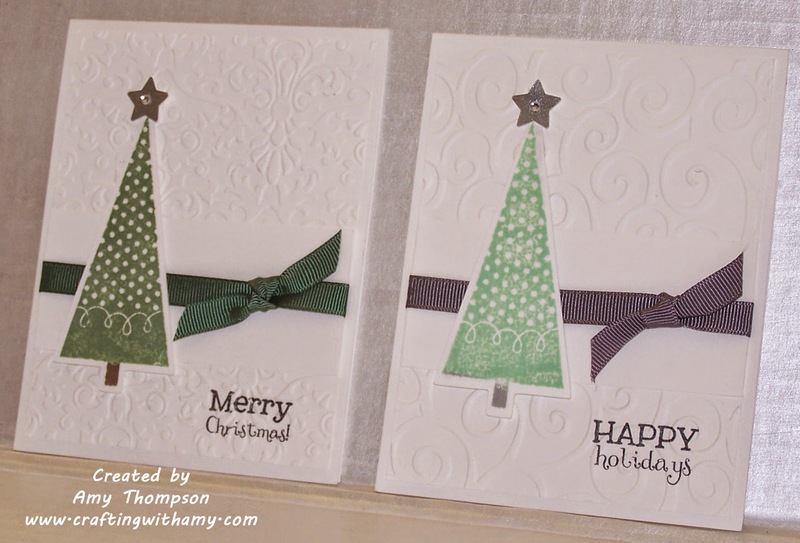 Here are a couple that I came up with using CTMH Art Philosophy Cricut cartridge and Season's stamp set. I embossed the background and then added some ribbon and pop dots to the tree. 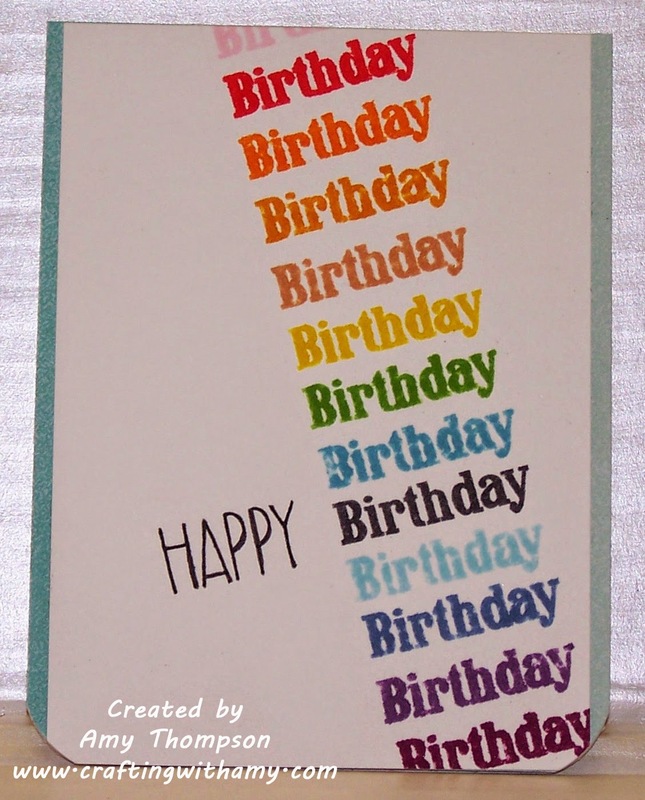 I stamped the sentiments from My Creative Time stamp sets. I hope you feel a little inspired. Please check out this weeks challenge going on over at Fantabulous Cricut Challenge blog. I am sharing with you another project I made after browsing Pinterest to get some Scary Halloween decor ideas. 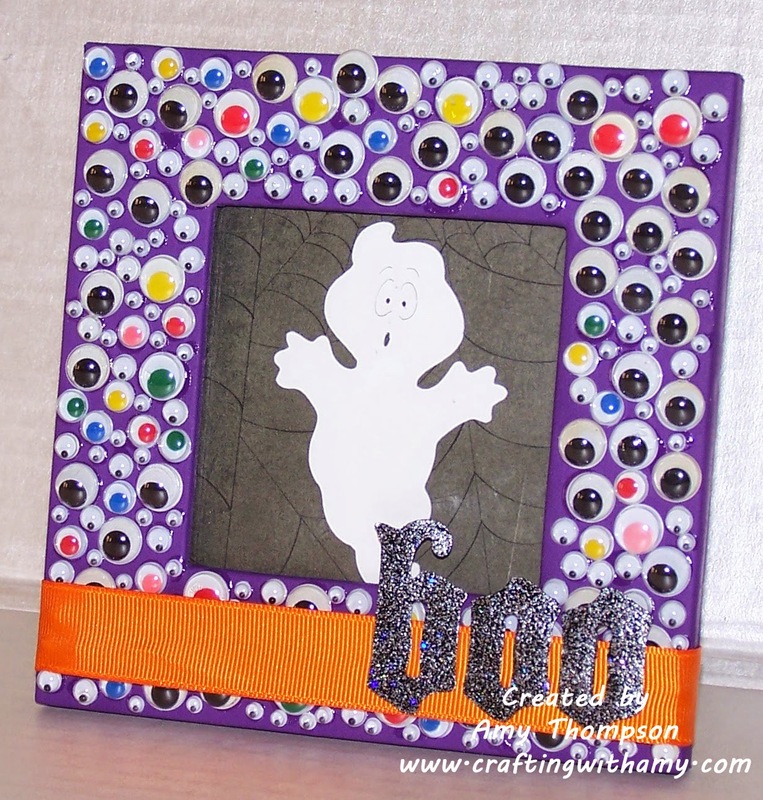 I painted this frame purple and then glued all these googlie eyes to the frame. I cut out the ghost and the sentiment on my Cricut then added a ribbon and glued the letters on. I just wanted to make a cute little Halloween decor. I hope you feel a little inspired. Please check out this weeks challenge going on over at Fantabulous Cricut Challenge blog. The cartridge that I used for this banner was A Child's Year. The paper that I used was DCWV Harvest Gathering. I cut the letters and the background paper and adhered them to some Recollections 3 in x 4 in paper sacks. I used some twine to connect all the letter of the banner. I hope that you enjoyed my banner today and will join us in this weeks challenge over at Fantabulous Cricut Challenge Blog. Here is another card I wanted to share with you. I used some texture paste and a stencil from Heidi Swapp to add the butterflies. 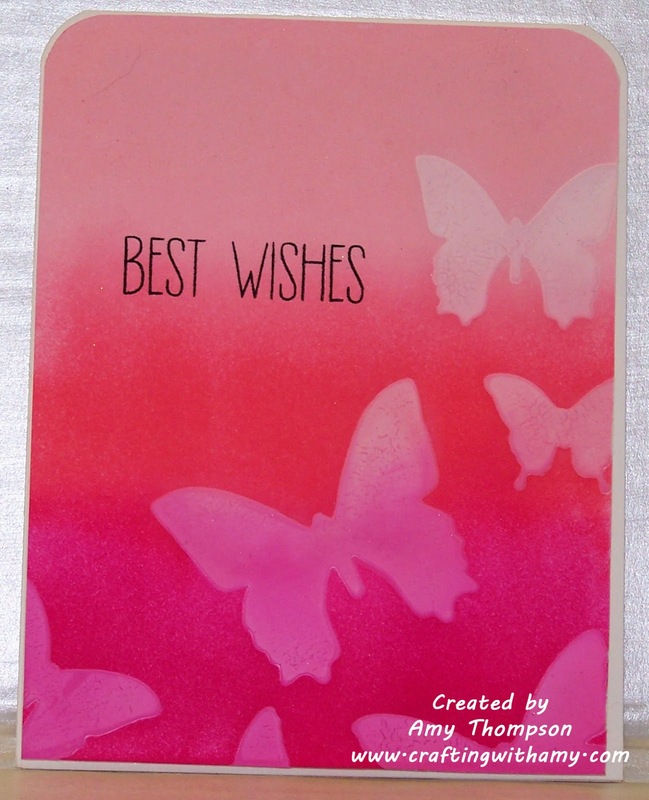 I then used some distress inks to ink up the card, stamped the sentiment and added it to the front of a card. I hope you like my card today and will check out this weeks challenge over at Fantabulous Cricut Challenge blog. Hi there and thank you for stopping by today. 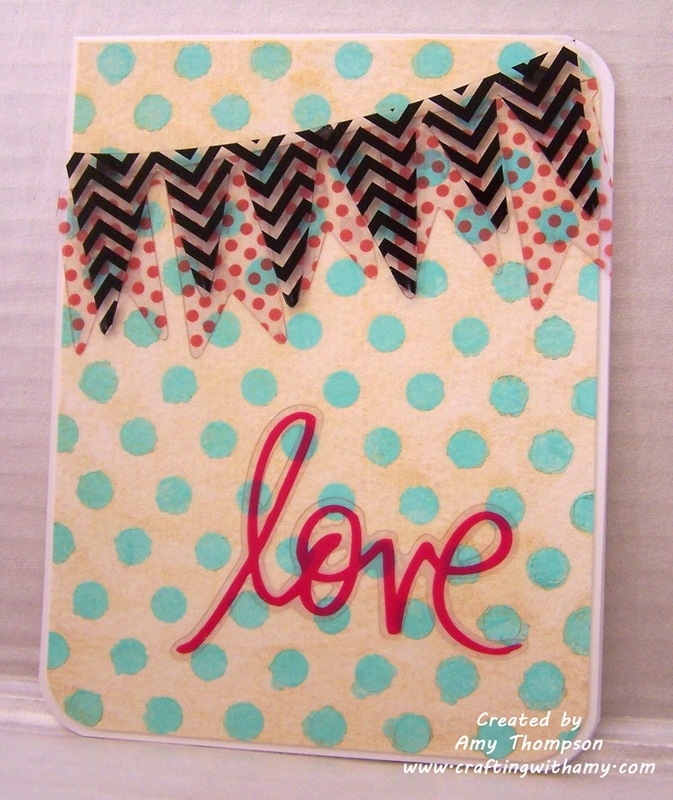 I wanted to share a card that I made using some Heidi Swapp products. I bought these banners and clear sentiments and really wanted to make some kind of a card with them. This is what I came up with. I used some shine spray and a polka dot stencil also. Thanks for stopping by today. I hope that you will try out this weeks challenge over at Fantabulous Cricut Challenge Blog. 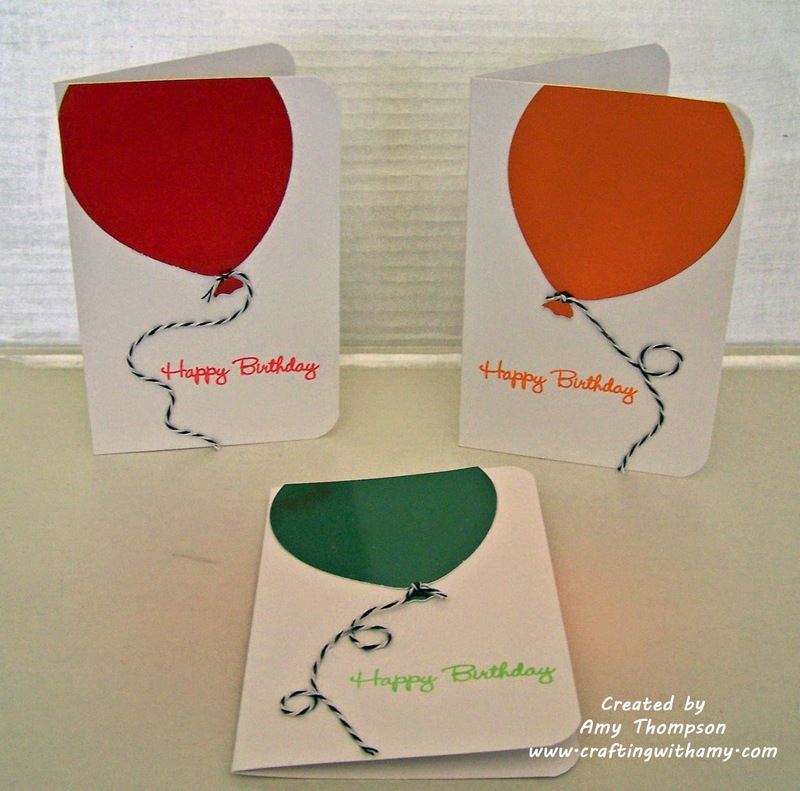 For my cards I used DCWV foiled cardstock for the baloons, black and white twine. The stamp set that I used was My Creative Time Gift Card Sentiments. Thank you for stopping by and I hope that you will join us in this weeks challenge.